Sam Raimi's trilogy featuring your friendly neighborhood web slinger is now over sixty percent off at Amazon! 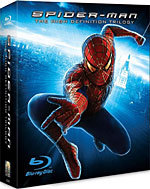 The online retailer has just reduced the price of 'Spider-Man: The High-Definition Trilogy' to just $24.99 (62% off suggested list price). Click here to swing down to Amazon and cash in on this deal!